Ready for transport and easily folded, the white 4-wheel Go-Go® Folding Scooter is perfect for the ultimate active lifestyle. 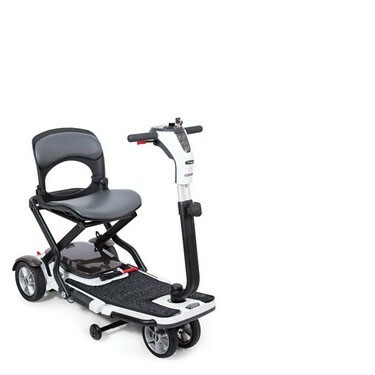 Offering great performance indoors and out at a maximum speed of 4 mph and a range per charge of up to 12.5 miles, it provides a comfortable and convenient ride. It is super portable and is a great space saver that fits perfectly inside any closet, corner, or vehicle trunk. The Go-Go Folding scooter is sleek, stylish, and extremely easy to operate, making it the perfect travel mobility scooter choice. Total weight without batteries: 51.4 lbs. Standard seating: Type: Foldable, compact, vinyl-covered molded plastic; Material: Gray Vinyl; Dimensions: 16" x 13"